Gender Reveal Baby Shower Decorations Package. Dream Big Little One Dream catcher Theme Party in a Box. FREE shipping. Reuse in Nursery! Announcement NEW items just added to my READY to Ship Section. Great for gifts or parties. I'm always happy to create unique party decorations to match your colors. I create custom party backdrops, fabric garlands and paper banners. Party decorations for birthday, baby shower, weddings, bridal shower, first birthdays, anniversary parties and more. Let's work together to make your special day unique! ***Please note that items in listings are samples (except ready to ship). As I hand make each order, your finished item may differ slightly from the sample photo. I do my very best to make each unique item match the photo as much as possible. I can create a custom "party in a box" package just for you. Just convo me here at Etsy! NEW items just added to my READY to Ship Section. Great for gifts or parties. I'm always happy to create unique party decorations to match your colors. Baby Shower Decorations Package. Dream Big Little One Dream catcher Theme Party in a Box. CUSTOM colors available. Reuse in Nursery! Baby Shower Decorations Package. Dream Big Little One Dream catcher Party in a Box. FREE shipping. CUSTOM colors available. Rainbow High Chair Banner. Girls First Birthday Party Supplies. Shabby Chic High Chair Banner with Burlap Flag. 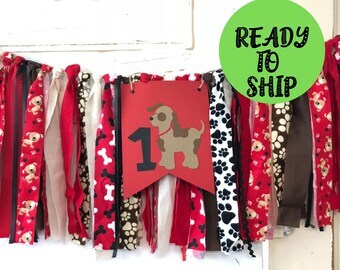 Puppy Dog High Chair Banner. Red 1st Birthday Decoration. Ready to Ship NOW. Custom Versions Also available. 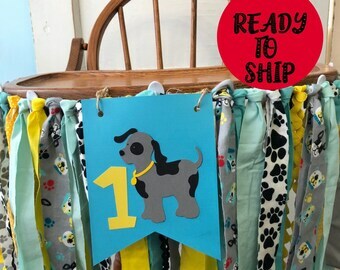 Puppy Dog High Chair Banner. Blue Yellow Gray One High Chair Decoration. Ready to Ship NOW. Custom Versions Also available. 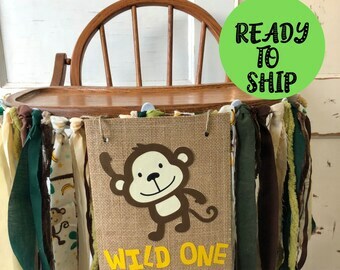 Woodland Camping High Chair Banner. 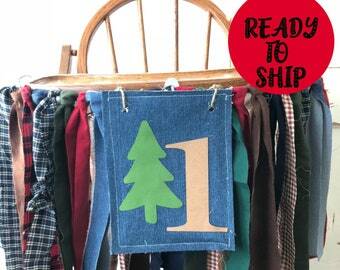 Denim One Banner and Rustic High Chair Decoration. Ready to Ship NOW. Custom Versions Also available. Can’t even begin to explain how beautiful this came out. It way surpassed my expectation!! Not only did she create my vision but she also kept me updated along the way!!!!! Thank you so much!!! Can’t wait to show you our 1 year photos in July!!! I purchased a custom dreamcatcher and might I say it is amazing. Everything I wanted plus more. Service was great and easy with no problems. I will definitely order again in the future. Perfect background banner for my son’s cake smash! It’s fully adjustable so you can make it look picture perfect! Found these great vintage pieces to include in some upcoming dream catchers !! So pretty. Here's a peak inside my Quilted Cupcake home studio. I'm inspired by the bright colors and creative chaos. Fabric garlands are a favorite of mine. Use for a birthday, shower, or wedding. Re-usable as home decor! High chair banners are great for birthday parties, smash cake photos & 1st birthday photo shoots. Avail. in any color! Ribbon style garlands to fit any party theme. You choose the colors! My eco-friendly garlands use vintage and re-purposed fabrics. They can be reused after the party as home decor. I've been crafting my whole life. I can't imagine my life without making things. Some of my earliest memories are digging through my mom's button tin and playing with fabric scraps under the quilt frame as my mom and grandma hand-quilted. I'm mostly self-taught, with lots of guidance and creative DNA from my crafty family. My early career was spent as a party planner, handling all the details of planning corporate events. I've transitioned into a party stylist and maker. My shop offers party supplies for weddings, baby showers and birthdays. I love creating new party items, and coordinating handmade items to fit your event theme. Whenever I need a creative boost, I head to one of my local thrift or antique stores. I love to look at the crazy things people have donated and find new uses for them. I fill my studio with repurposed treasures to keep me inspired. My favorites are vintage Fisher Price toys and hand-painted ceramics from the 1970's. A lifelong crafty gal, I enjoy all aspects of the creative process. Thanks for stopping by! I'm Jean, aka QuiltedCupcake. My QuiltedCupcake Etsy shop features unique party decorations. I like to use happy, unique materials that make you smile. While most of my party decorations listed are for the most common party themes, such as carnival, mermaids, pirates and princesses, I'm also happy to design one-of-a-kind decorations to fit your party. I love working on first birthday parties, baby showers, bridal showers and weddings. If there's cake involved, I'm your girl! ***Please note that all items in listings are samples. As I hand make each order, your finished item may differ slightly from the sample photo. I do my very best to make each unique item match the photo as much as possible in theme and color. Please contact me before ordering if you have any questions about the nature of my handmade goods. I want you to be happy with your purchase, and will do all that I can to make shopping Etsy's handmade marketplace a great experience for you. Due to the nature of the handmade items in my QuiltedCupcake Etsy shop, items cannot be returned for a refund. If there is a sizing issue, I can usually offer an exchange. Personalized items (such as items with names or custom orders) cannot be returned or exchanged. Buyer is responsible for the cost of returning items for exchange. Shipping costs paid at time of order are non-refundable. If there is a problem with your order, please let me know ASAP. I accept Paypal, Etsy Direct Checkout or Etsy gift cards. I ship via USPS first class mail, or Priority Mail. Handmade items generally ship 14 days from date of purchase, unless otherwise indicated in listing or arranged via convo. or rush. All orders include a tracking number, and you will receive a shipment notification with USPS tracking number when your item is shipped. No refunds are provided for items shown as delivered by USPS. Items will ship to the address on your Etsy account, unless you inform me of a different address. Please check the address to be sure it's correct. Orders sent to improperly entered addresses are not refundable. Shipping costs are quoted for U.S. orders. For other countries, please contact me. I'm happy to arrange international shipping, just need to figure out the correct shipping cost. Custom orders always welcome - just convo me. If you have any questions about my shop, or a specific item, please feel free to convo me here at Etsy - I check in several times a day.